Get ready California. We're marching to end neighborhood drilling, keep oil and gas in the ground, and accelerate the just transition to 100% renewable energy. It's time to end the age of fossil fuels. Join #‎BreakFreeLA now. WE WILL BE MAKING CALLS FROM HOME. YOU CAN CALL AT YOUR CONVENIENCE. PLEASE EMAIL ELLIE AT EASH0991@GMAIL.COM OR CALL AT 401-633-4611 TO HELP MAKE CALLS. 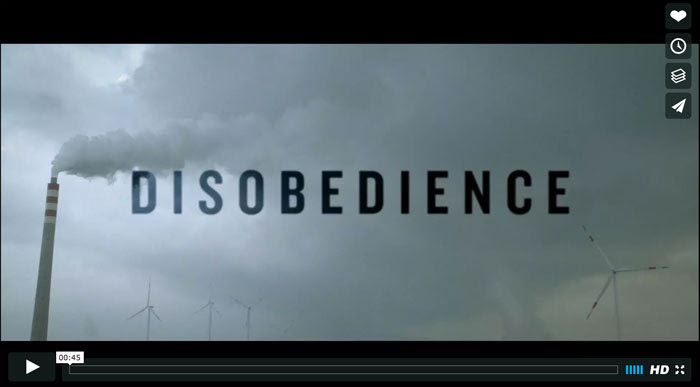 Disobedience is a sequel of sorts to the film Disruption that played a big role in mobilizing people for the People's Climate March in 2014 -- so you know it will have an impact. Click here for the screening on Saturday at Lisa and Jeremy's in the East Bay where you can see it with others.